LTE Lift Truck Equipment S.p.A. has been producing masts and equipments for lift truck for more than 30 years, reaching a production volume of more than 10.000 masts per year. 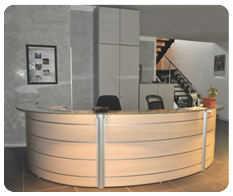 The company’s headquarters are located in the industrial area of Ostellato (FE) Italy. LTE owns both the know-how and the technology and as such are able to offer a mix of products suitable for a wide range material handling applications. Our customers are producers of forklift trucks (CB, warehouse, side loader, off road etc.) that require performing and reliable products, for both standard and special application, designed according to their specifications. LTE applies TPS (Toyota Production System) principles in order to guarantee the highest quality standards, in manufacturing, after sales and parts service.